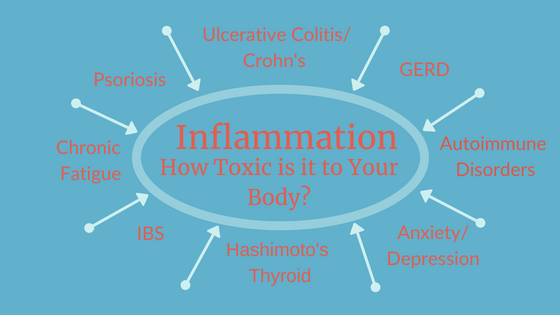 Talking about inflammation is all the buzz these days but do you really understand how chronic inflammation can be toxic to your body? Are you struggling with your health but cannot find the answers you need? Have you wondered if chronic inflammation could be your problem? Check out my 5 tips below to help reduce chronic inflammation so you can start feeling like yourself again. What the heck is the definition of inflammation? Have you every cut or injured yourself? Have you noticed it may swell, visually redden or feel warm to the touch, these are all signs of inflammation. It’s your immune system turned on and working to repair the injury. Your white blood cells are always ready to attack and fight off foreign invaders such as chemicals, viruses and bacterial toxins. Short-term or acute inflammation is your body’s natural process to protect itself from harm. Consequently, when your body’s immune system is “turned ON” all the time to fix a problem but no solution exists this becomes a concern. This is called chronic inflammation and it can be linked to almost if not all chronic illnesses or diseases. For example, arthritis is chronic inflammation of the joints and ulcerative colitis is chronic inflammation of the colon. Inflammation is even connected to heart disease, cancer, diabetes and autoimmune disorders. All of the above contribute to low levels of chronic inflammation. If chronic inflammation is not corrected, over time it most certainly will lead to the development of chronic diseases. Do you want to start feeling better, living better? You need to decrease the amount of inflammation in your body. As you have been reading along are you wondering if your body is highly inflamed, do you think inflammation is the root cause of your health issues? If you suffer from the following you should consider lowering the amount of inflammation in your body. As a result it will improve your quality of life so you can live the life you dream of! Consume a Variety of Plants! It doesn’t matter what type of diet you follow plant foods should make up the majority of your diet. What is considered a plant? Fruits, vegetables, whole grains, nuts/nut butters, seeds and legumes (beans, lentils and peas). Plant foods provide your body with a boost of nutrients including; fiber, vitamins, minerals, antioxidants and anti-inflammatory phytonutrients. You can find a lot of great plant products on Thrive Market. I do have an affiliate link with Thrive Market and as a result get a very small commission if you sign up to become a member. If you are not sure what Thrive Market is or if it is right for you, read my blog on why I think Thrive Market is a great resource. Move More! Just 20 minutes of moderate exercise can produce an anti-inflammatory cellular response in the body. Not to mention it can also improve your energy level, mood, endurance, blood circulation, heart rate, cholesterol levels, blood pressure levels and reduce the effects of coronary artery disease. Studies have shown that long-term moderate exercise can prevent a pro-inflammatory state seen with aging. Rest More and Stress Less! Many think they do not need 8 hours of sleep but they are wrong. Rest/sleep is a time for the body to rest, repair and rejuvenate. If you do not give your body enough time it cannot go through these critical steps. In regards to stress it’s imperative that you acknowledge it is not just an emotion but also a physical response that impacts the body. Chronic stress is associated with poor blood sugar regulation and weight gain, along with immune system suppression and poor digestion. Typically, with chronic stress you see other habits suffer as well such as sleep and healthy eating. Lack of sleep and high stress levels are two things that can lead to unhealthy habits and high levels of chronic inflammation. Spice Up Your Food! Adding in a variety of spices and herbs not only adds lots of flavor and delicious smells to your cooking but most noteworthy they also pack a punch of anti-inflammatory properties. One of the top spices to include in your diet is turmeric. Curcumin, a compound found in turmeric has been shown to reduce inflammation in the body. Other spices and herbs that can help reduce inflammation are ginger, cinnamon, garlic, cayenne pepper and cloves. Identify Food Sensitivities! Your body may be producing an immune response to specific foods, even healthy ones! As a result, continuing to eat these foods over and over is consequently contributing and provoking a heightened immune response and chronic inflammation. For that reason, being able to identify these foods with food sensitivity testing followed by an anti-inflammatory will allow you to decrease inflammation in your body and allow it to start healing from the inside out. Above all, you need to make some changes. As a result, you will feel better, you will improve your health, and above all you can live the life you dream of! It takes time and commitment to change your nutrition and lifestyle habits but it can be done. Reducing inflammation in your body starts the healing process from the inside out so you can take back control of your health and your life. If you have decided that you need to change some areas in your life but probably need assistance or you know that food sensitivity testing could be a game changer for you don’t be afraid to reach out. Above all, I’m here to guide you down the road to good health so you don’t have to feel sick anymore! 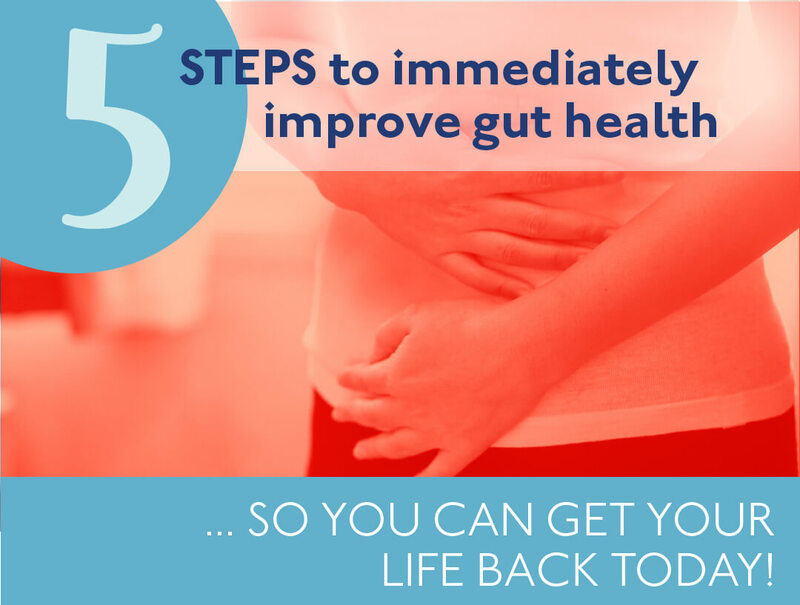 Finally, grab your FREE handout today and follow the 5-Steps To Immediately Improve Gut Health! This is great information on how you can decrease inflammation and restore health to your body. 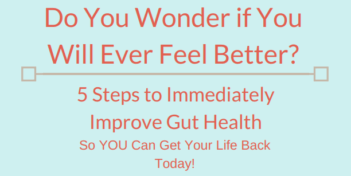 As a result of downloading your FREE guide, if you have questions once you’ve reviewed the information, don’t hesitate to reach out for a FREE 20-minute consultation or fill out the contact form on my website so we can connect.